An immensely powerful international organization that most people have never even heard of secretly controls the money supply of the entire globe. It is called the Bank for International Settlements, and it is the central bank of central banks. It is located in Basel, Switzerland, but it also has branches in Hong Kong and Mexico City. It is essentially an unelected, unaccountable central bank of the world that has complete immunity from taxation and from national laws. Even Wikipedia admits that “it is not accountable to any single national government.” The Bank for International Settlements was used to launder money for the Nazis during World War II, but these days the main purpose of the BIS is to guide and direct the centrally-planned global financial system. Today, 58 global central banks belong to the BIS, and it has far more power over how the U.S. economy (or any other economy for that matter) will perform over the course of the next year than any politician does. 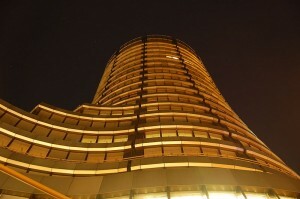 Every two months, the central bankers of the world gather in Basel for another “Global Economy Meeting”. During those meetings, decisions are made which affect every man, woman and child on the planet, and yet none of us have any say in what goes on. The Bank for International Settlements is an organization that was founded by the global elite and it operates for the benefit of the global elite, and it is intended to be one of the key cornerstones of the emerging one world economic system. It is imperative that we get people educated about what this organization is and where it plans to take the global economy. Sadly, only a very small percentage of people actually know what the Bank for International Settlements is, and even fewer people are aware of the Global Economy Meetings that take place in Basel on a bi-monthly basis. Every two months, more than a dozen bankers meet here on Sunday evenings to talk and dine on the 18th floor of a cylindrical building looking out on the Rhine. The dinner discussions on money and economics are more than academic. At the table are the chiefs of the world’s biggest central banks, representing countries that annually produce more than $51 trillion of gross domestic product, three-quarters of the world’s economic output. The Bank of England’s Mr. King leads the dinner discussions in a room decorated by the Swiss architectural firm Herzog & de Meuron, which designed the “Bird’s Nest” stadium for the Beijing Olympics. The men have designated seats at a round table in a dining area scented by white orchids and framed by white walls, a black ceiling and panoramic views. Serious matters follow appetizers, wine and small talk, according to people familiar with the dinners. Mr. King typically asks his colleagues to talk about the outlook in their respective countries. Others ask follow-up questions. The gatherings yield no transcripts or minutes. No staff is allowed. So the fate of the world economy is determined by unelected central bankers in secret meetings that nobody ever hears about? That certainly does not sound very “democratic”. But this is the direction that “global governance” is taking us. The elite believe that the “big decisions” are far too important to be left “to the people”, and so most of the “international institutions” that have been established by the elite operate independently of the democratic process. Sadly, the truth is that all of this has been planned for a very long time. [T]he powers of financial capitalism had another far-reaching aim, nothing less than to create a world system of financial control in private hands able to dominate the political system of each country and the economy of the world as a whole. This system was to be controlled in a feudalist fashion by the central banks of the world acting in concert, by secret agreements arrived at in frequent private meetings and conferences. The apex of the system was to be the Bank for International Settlements in Basle, Switzerland, a private bank owned and controlled by the world’s central banks which were themselves private corporations. For many years the BIS kept a very low profile, operating behind the scenes in an abandoned hotel. It was here that decisions were reached to devalue or defend currencies, fix the price of gold, regulate offshore banking, and raise or lower short-term interest rates. In 1977, however, the BIS gave up its anonymity in exchange for more efficient headquarters. 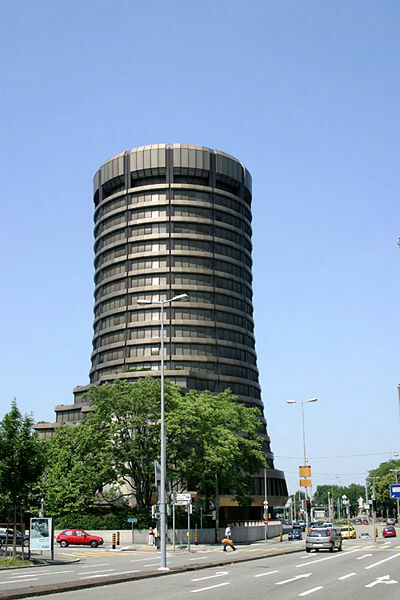 The new building has been described as “an eighteen story-high circular skyscraper that rises above the medieval city like some misplaced nuclear reactor.” It quickly became known as the “Tower of Basel.” Today the BIS has governmental immunity, pays no taxes, and has its own private police force. It is, as Mayer Rothschild envisioned, above the law. Yes, it most definitely does bear a striking resemblance to the Tower of Babel as you can see from the photo in this article. Once again the global elite are trying to unite humanity under a single system, and that is most definitely not a good thing. But many of these elitists are entirely convinced that “global governance” is what humanity desperately needs. They even publicly tell us what they plan to do, but most people are not listening. In the area of central bank cooperation, the main forum is the Global Economy Meeting (GEM), which gathers at the BIS headquarters in Basel. Over the past few years, this forum has included 31 governors as permanent members plus a number of other governors attending on a rotating basis. The GEM, in which all systemic emerging economies’ Central Bank governors are fully participating, has become the prime group for global governance among central banks. The speech was entitled “Global Governance Today”, and you can find the full transcript right here. But most people have never even heard that such a thing as a “Global Economy Meeting” even exists because the mainstream media rarely discusses these sorts of things. They are too busy focusing on the latest celebrity scandal or the latest cat fights between the Republicans and the Democrats. The mission of the Bank for International Settlements (BIS) is to serve central banks in their pursuit of monetary and financial stability, to foster international cooperation in those areas and to act as a bank for central banks. serving as an agent or trustee in connection with international financial operations. The head office is in Basel, Switzerland and there are two representative offices: in the Hong Kong Special Administrative Region of the People’s Republic of China and in Mexico City. But when you start looking into the details, things get much more interesting. It accomplishes this through control of currencies. It currently holds 7% of the world’s available foreign exchange funds, whose unit of account was switched in March of 2003 from the Swiss gold franc to Special Drawing Rights (SDR), an artificial fiat “money” with a value based on a basket of currencies (44% U.S. dollar, 34% euro, 11% Japanese yen, 11% pound sterling). The bank also controls a huge amount of gold, which it both stores and lends out, giving it great leverage over the metal’s price and the marketplace power that brings, since gold is still the only universal currency. BIS gold reserves were listed on its 2005 annual report (the most recent) as 712 tons. How that breaks down into member banks’ deposits and the BIS personal stash is unknown. By controlling foreign exchange currency, plus gold, the BIS can go a long way toward determining the economic conditions in any given country. Remember that the next time Ben Bernanke or European Central Bank President Jean-Claude Trichet announces an interest rate hike. You can bet it didn’t happen without the concurrence of the BIS Board. In recent years, it has become increasingly obvious who really has power over our economy. When Barack Obama speaks, the markets usually move very little. When Ben Bernanke speaks, the markets often respond with wild gyrations. In all, 13 other central banks in the world have followed the Fed’s lead and set interest rates at or near zero in an effort to keep the liquidity spigots open and prop up their ailing economies. Those 14 economies represent a staggering $65 trillion in combined equity and bond market capitalizations, according to Bank of America Merrill Lynch. Indeed, central banking has become an economy unto itself, a multi-trillion-dollar empire that massages and manipulates markets, which respond to the slightest news out of the respective entities’ policy making committees. So who controls the money? The central banks of the world do. And who controls those central banks? The Bank for International Settlements does. If we don’t like what the Bank for International Settlements is doing, can we do anything about it? In other words they can do whatever they want, without consequences. How’s that for a leak-proof legal umbrella? If the BIS wants to “intervene” in the financial markets, they simply just do it. If the BIS wants to bail out big banks or even entire nations, they simply just do it. Q: Where does an 800 pound gorilla sit? A: Anywhere it wants to. So what is next for the Bank for International Settlements? But in the end, how you feel about the BIS may come down to how you feel about a one-world currency. The bank was a major player promoting the adoption of the euro as Europe’s common currency. There are rumors that its next project is persuading the U.S., Canada and Mexico to switch to a similar regional money, perhaps to be called the “amero,” and it’s logical to assume the bank’s ultimate goal is a single world currency. That would simplify transactions and really solidify the bank’s control of the planetary economy. But if the United States ever did give up the U.S. dollar, it would be a massive blow to our national sovereignty. When someone else controls your money, it doesn’t really matter that much who makes the laws. Unfortunately, the global elite seem absolutely obsessed with the idea of a global currency, a one world economic system and a global government. None of those things will happen this year, but that is where we are moving. With each new crisis that arises, the solutions that we will be given will always involve more centralization and more globalization. So what do you think about all of this?